The MoUs were signed for Himayat Scheme under the aegis of Deen Dayal Upadhyaya Grameen Kaushalya Yojana (DDU-GKY)), Ministry of Rural Development, Government of India. Jammu and Kashmir Government, through State Rural Livelihoods Mission (SRLM), today signed MoUs worth Rs 120.99 crore with three agencies namely Apollo Medskills, Surya Wires Ltd and Manpower Group Services India Ltd for skilling the youth of J&K and their subsequent job placements within the country. Under the scheme, companies will train and place 9200 youth in Healthcare, IT, BPO, Banking and Iron Steel sectors. 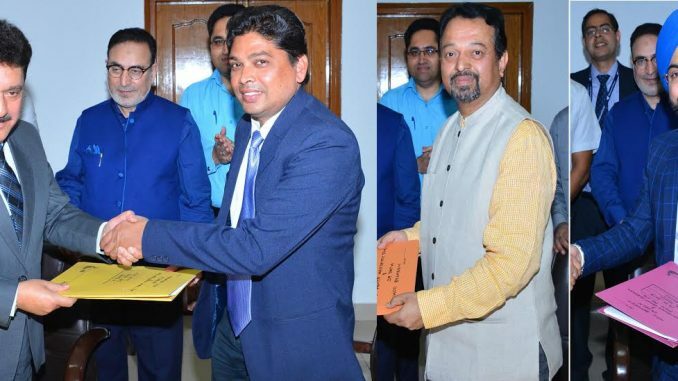 At the MoU signing ceremony, Secretary, Department of Rural Development and Panchayati Raj, Kifayat Hussain Rizvi, said that the youth of the state are talented enough but need a handholding to show their worth. After signing the MoU, Dr G N Qasba – Mission Director JKSRLM /CEO – Himayat informed that the program is aimed at skilling 6 lakh J&K youth for assured employment within the country. The MoU was signed at J&K House New Delhi in presence of Anil Subramaniam, Director, Rural Skills Division, DDUGKY, GOI, K K Siddha, Additional Secretary, Department of Rural Development and Panchayati Raj, Govt of J&K, Murtaza Hussain, Regional Representative – North, DDU-GKY, GOI, Adil Ashraf and Mr Mohammad Amin JKSRLM. The project implementing agencies were represented by S Shridhar (Apollo Mediskills Ltd), Dr Abhishek (Surya Wires Ltd) and Philip Christopher (Manpower Group Services India Ltd).